A free perk is coming back to American Airlines. It's not more personal space, but at least now you'll have something free to snack on when sitting in the main cabin. American Airlines (AAL) will start offering passengers on domestic flights complimentary snacks by April. 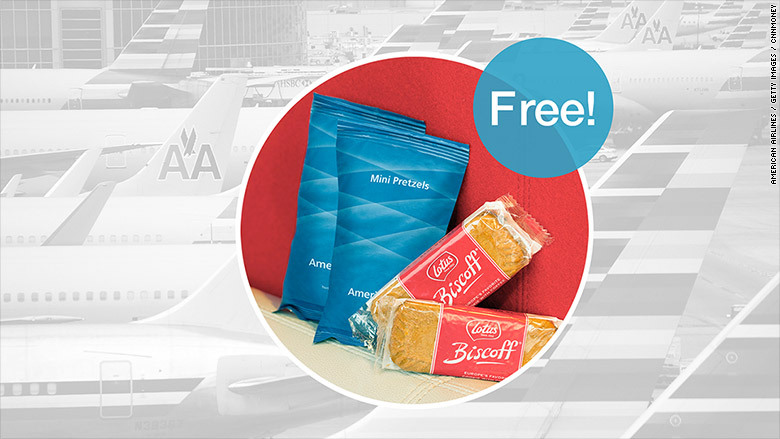 Free snacks will be handed out on transcontinental flights this month. Early-bird travelers taking off before 9:45 am will receive Biscoff cookies. Passengers departing later will be offered either the cookies or pretzels. American had stopped offering free snacks in the main cabin in 2003. American Airlines is also expanding its free entertainment options. Customers on domestic flights with in-seat TVs will have access to up to 40 movies, 60 TV shows and 300 music albums. Airline companies have been posting record profits recently thanks to lower oil prices and strong travel demand. Lower fuel costs brought in a combined $11.1 billion in savings to the nation's four top airlines during the first nine months of 2015. "We are finally at a place where we can invest in our overall product and not just in premium," said Laura Nedbal, spokesperson at American Airlines. "This is our opportunity to bring back amenities and invest in the main cabin as well." In early December, United Airlines (UAL) announced it would start offering complimentary snacks to fliers in traveling in economy in February.